A helpful guide for the serious violinist. 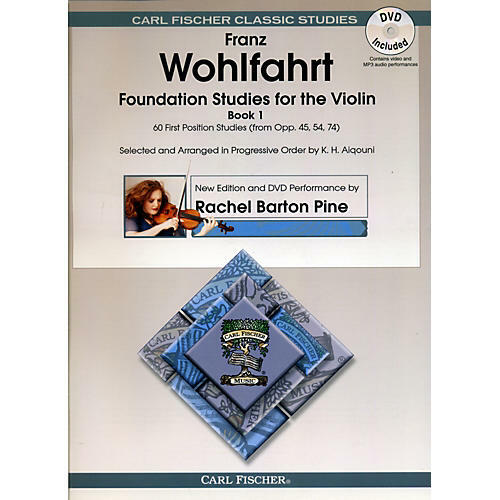 The quintessential violin method just got even better with a new edition of Foundation Studies for the Violin, Volume 1 - 60 First Position Studies, expertly updated and edited by world-famous violinist Rachel Barton Pine. It contains modernized fingerings, bowings and dynamics by Pine, all newly engraved for this edition. At the same time it remains faithful to the original, maintaining the same pedagogical sequence as Aiqouni's classic edition. This edition also includes a DVD of Rachel Barton Pine playing all 60 etudes, with two camera views so students can choose to see either the bow or the left hand technique. For beginning to intermediate players.